If you go down to these woods, you’re in for a surprise all right: a camping experience on a whole other level. Peeling back the down duvet and reaching for a fluffy robe as you rise from your queen-size mattress before padding into your marble-tiled bathroom, you may feel for all the world like you’re in a plush hotel. Except that right outside your retro Airstream trailer is a towering redwood forest, and you’re in the thick of it. 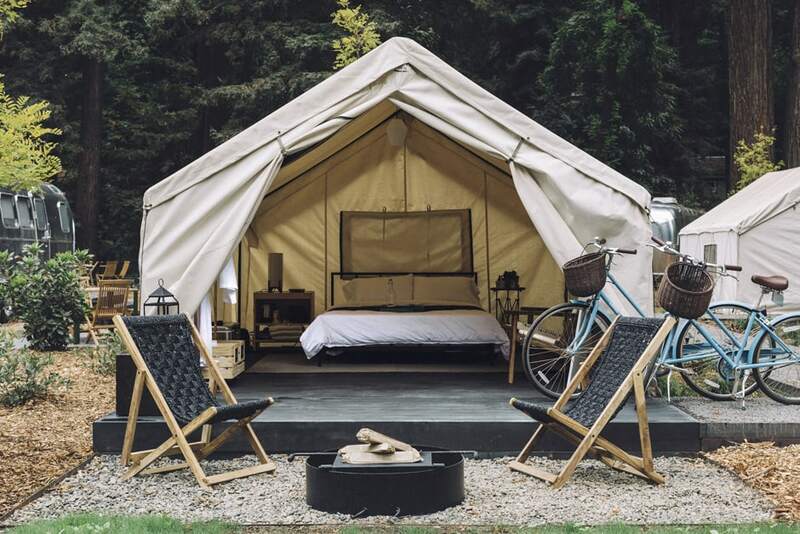 This is glamping AutoCamp Russian River-style, 90 minutes north of San Francisco in California’s Sonoma wine country. 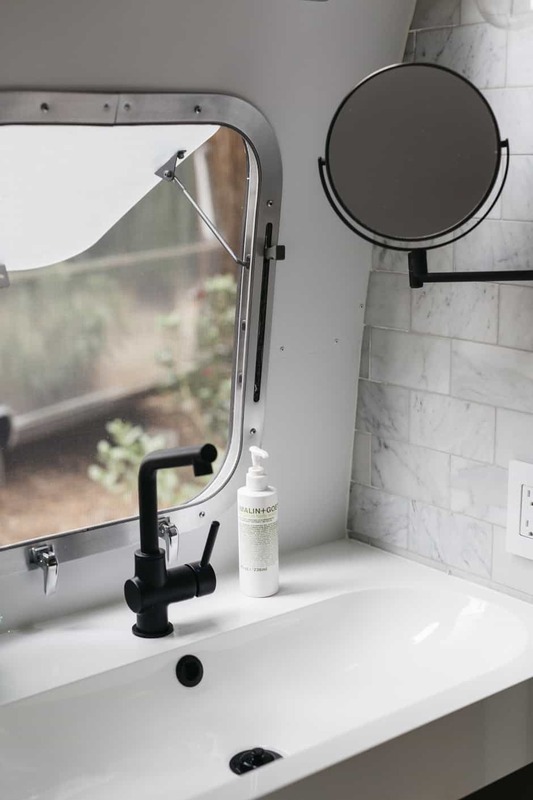 AIRSTREAM INTERIORS Classic ‘silver bullet’ Airstreams have been produced for 85 years, but AutoCamp’s feature marble-tiled bathrooms, flatscreen TVs, bluetooth sound systems and private patios. Opened late last year, Russian River is the second AutoCamp location – there’s another one in Santa Barbara. 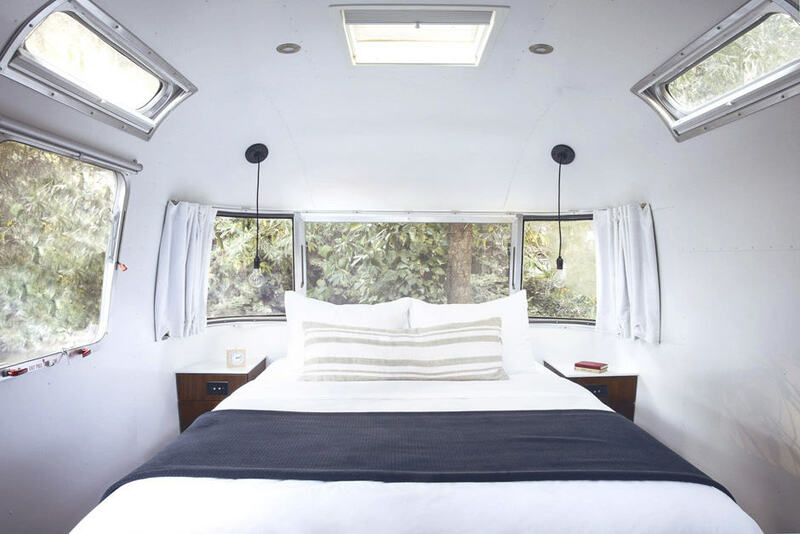 The work of California natives Ryan Miller and Neil Dipaola at Mesa Lane Partners, it’s folksy meets fancy, featuring custom-designed Airstreams and luxury tents. The hub of the glampsite is the Clubhouse. 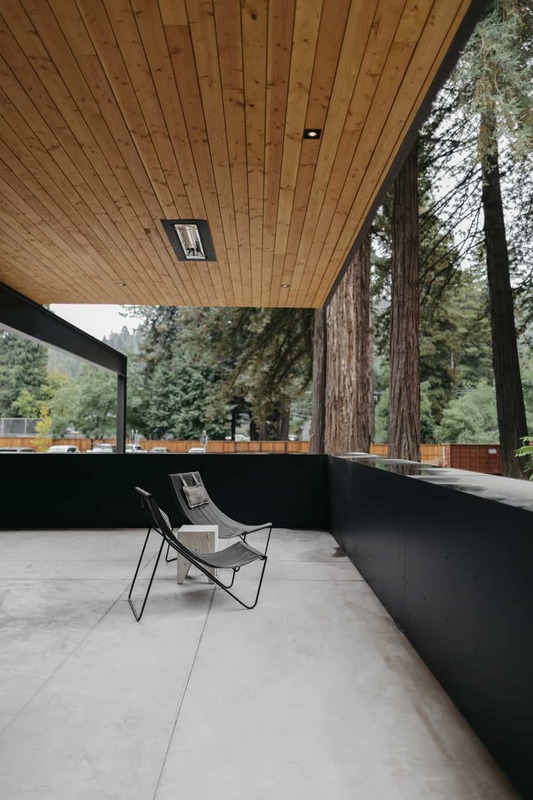 Designed by a team from Anacapa Architecture, led by Dan Weber, the midcentury modern structure draws inspiration from the iconic Barcelona Pavilion by Mies van der Rohe and the Kauffman House in Palm Springs by Richard Neutra. 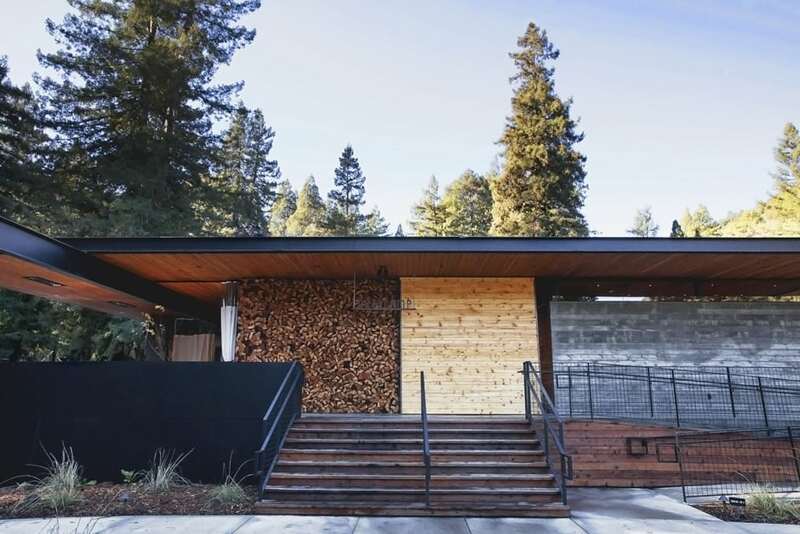 Crafted from simple, robust materials (concrete, rough-sawn local redwood and blackened steel) that help to safeguard it against the periodic flooding that strikes the area, it blurs the boundary between homely and wild, allowing unhampered views of the redwoods, a sprawling meadow of native grasses and the adjacent Hulbert Creek. THE CLUBHOUSE The Clubhouse is home to the reception, office and store; kitchen and dining facilities; swanky, spa-like communal bathrooms stocked with toiletries by Malin + Goetz; and lounge areas where guests can play board games and listen to records. 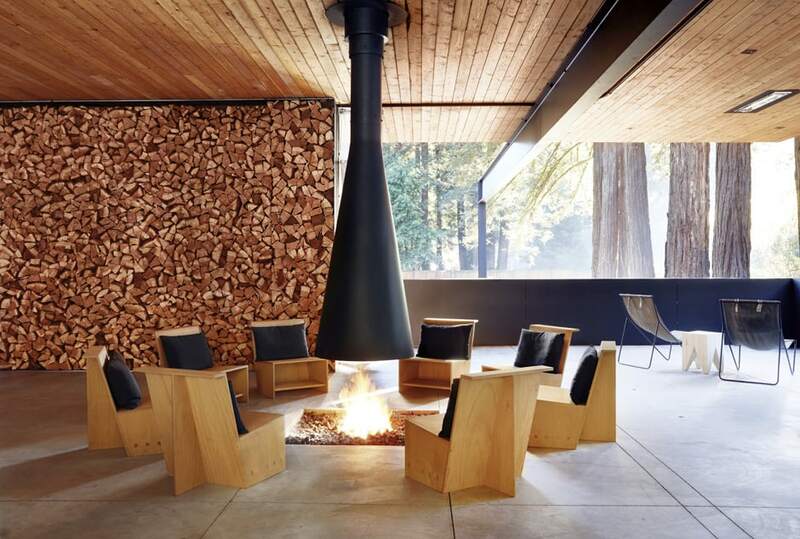 In the one pictured above, chairs by Alexis Moran surround a suspended fireplace. Interior designer Lauren Geremia is behind Russian River’s furniture, art, lighting and accessories. She and her team at Geremia Design worked mainly with local creatives to produce a range of custom pieces, such as the paintings by Joe Ferriso unique to each Airstream, and tables and chairs by Alexis Moran. LUXURY TENTS The luxury tents are complete with power points, lighting by Schoolhouse Electric, lounge chairs and solid walnut bedroom furniture. “I selected quality items that still have a casual aesthetic,” says Lauren. For all the glam in this glamping experience, it’s still back to nature. The river’s right there for swimming and kayaking, as is the Pacific Ocean and, of course, there are the vineyards. 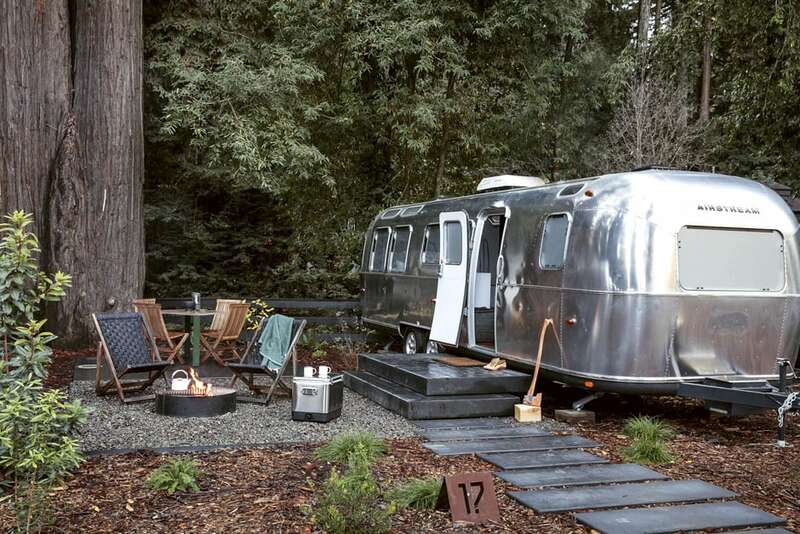 Take a hike or one of AutoCamp’s vintage cruiser bikes to the eateries, bars and galleries of artsy Guerneville mere minutes away; picnic in the meadow; play lawn games or tennis. Just don’t forget to pack your best PJs – you wouldn’t want to let the side down.